The recently renovated library, named for late MIT Professor Jule Charney, now offers a welcoming space for students to interact both socially and academically. Late MIT Professor Jule Charney, widely considered the “pioneer of modern dynamical meteorology,” mentored countless students over his quarter century at MIT. Charismatic and open-minded, Charney had a knack for bringing people together, encouraging scientific collaboration across disciplines and borders. 35 years ago, EAPS created the Jule Charney Library on the 14th floor of the Green Building in honor of Charney and to provide a space for students and faculty to continue such collaboration. Over the years, the library provided much-needed, invaluable work and study space for the EAPS community, but after over three decades of constant use, it was time for a change. 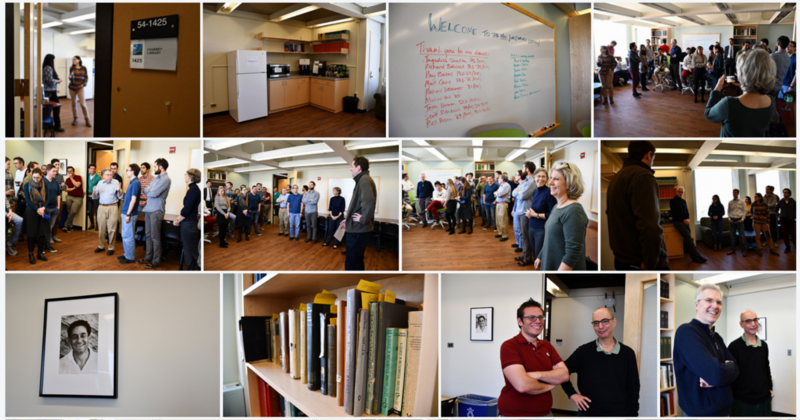 On December 5, 2018, faculty and students unveiled the updated and expanded Charney Library, located on the 14th floor of the Green Building, right across the hall from the famed professor’s former office. The student-initiated renovation project, made possible by generous alumni donations, transformed the library from a dark, cramped space into a bright, modern multi-purpose common space where members EAPS can interact both socially and academically. Read the full story about the renovation project and unveiling. The Charney Library is open to the EAPS community. Students or faculty may contact Darius Collazo if they would like to use it for a community event.